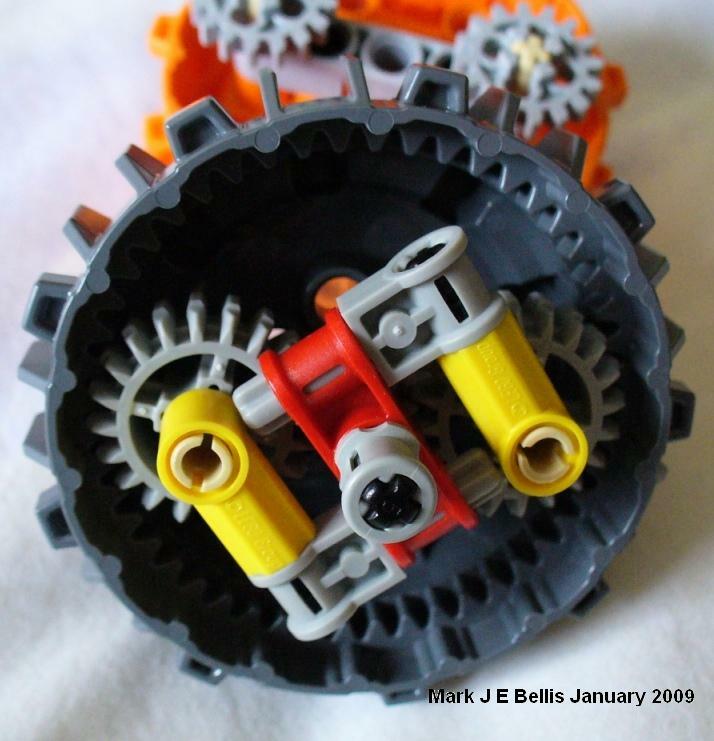 LEGO has finally designed a ring gear (of a reasonable size), very useful to build a planetary gear set. 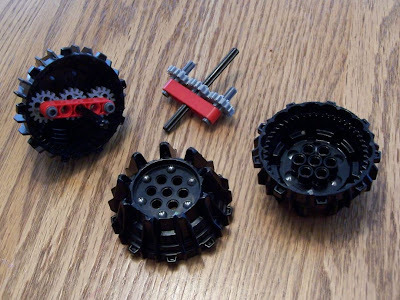 Although the parts themselves might be not very useful for Technic models or to get released into LEGO Technic sets. This was released with set 8960 (Thunder Driller), from the Power Miners theme. 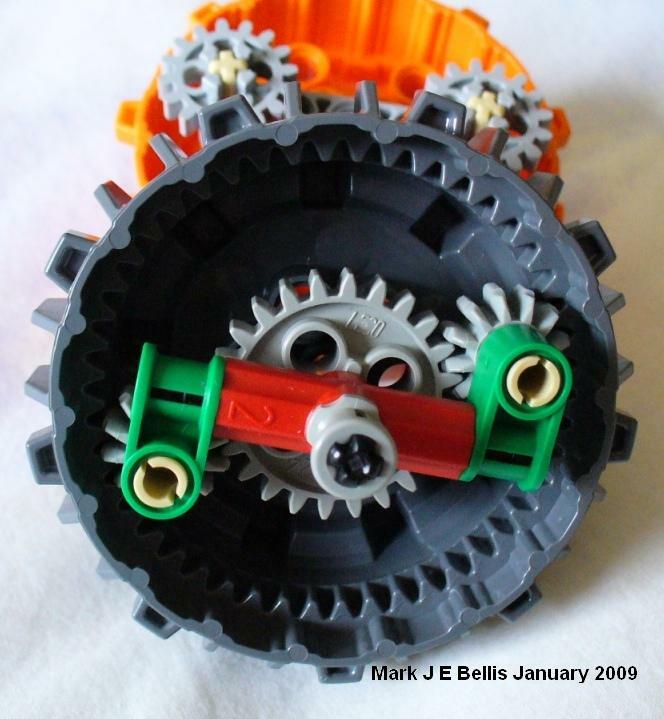 A front drill has two counter-rotating parts, driven by a planetary gear construction within the ring gear (larger part) with 48 teeth. It is much more manageable in size than the Hailfire Droid Wheel, released with 4481 (Hailfire Droid) in 2003. However it may be of difficult integration within a Technic model, just because of its form factor. Photos gently provided by Brian Davis. 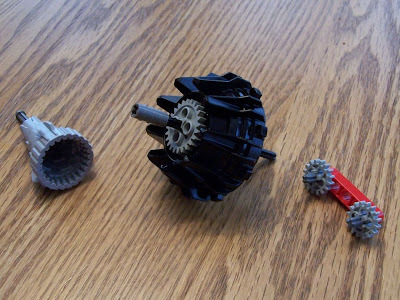 Below also some other related examples, that I found in a fast search about planetary gears systems, made with LEGO. 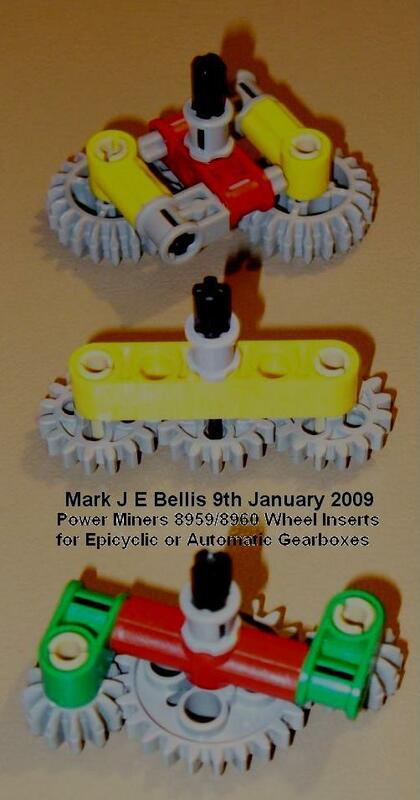 A LEGO planetary gear box video from Bill on the left, and one planetary gear reduction from John Doe on the right. Planetary gearing or Epicyclic gearing is a gear system that consists of one or more outer gears, or planet gears, revolving about a central, or sun gear. Typically, the planet gears are mounted on a movable arm or carrier which itself may rotate relative to the sun gear. Epicyclic gearing systems may also incorporate the use of an outer ring gear or annulus, which meshes with the planet gears. In many epicyclic gearing systems, one of these three basic components is held stationary; one of the two remaining components is an input, providing power to the system, while the last component is an output, receiving power from the system. The ratio of input rotation to output rotation is dependent upon the number of teeth in each gear, and upon which component is held stationary. For a more detailed explanation on how this system work and ratio calculations, please refer to the extra links at the bottom of this post. Advantages of planetary gears over parallel axis gears include high power density, large reduction in a small volume, multiple kinematic combinations, pure torsional reactions, and counter-rotating coaxial shafting. Disadvantages include high bearing loads, inaccessibility, and design complexity. Some days ago, Mark Bellis also presented is Power Functions motorized 8960, Thunder Driller. 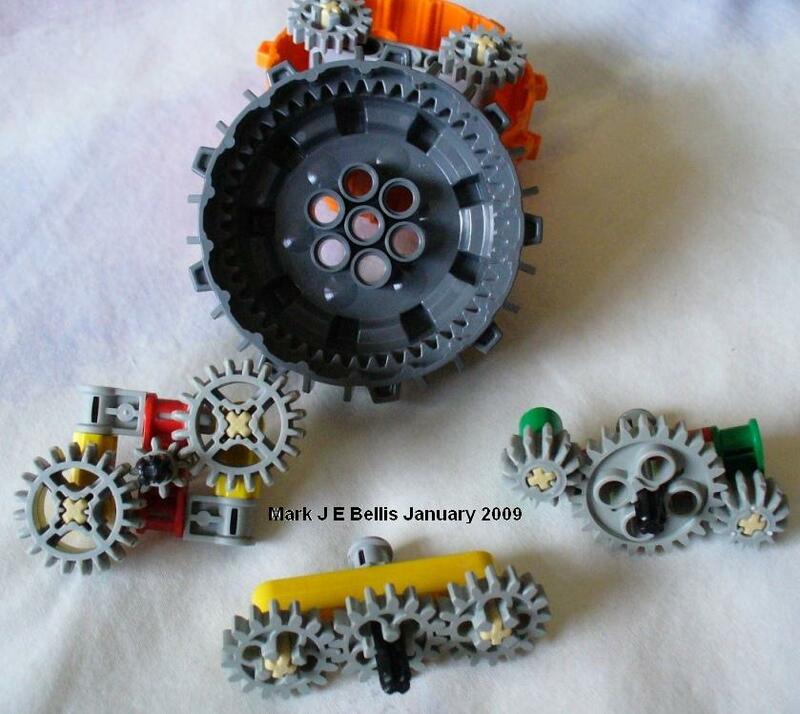 He developed some ideas around this epicyclic gear setup, namely Technic structures which allows for use of different gear combinations and thus, different gear ratios. These setups may however have a limited utilization, for high torque applications. You may find all the photos from Mark, under his BS folder. 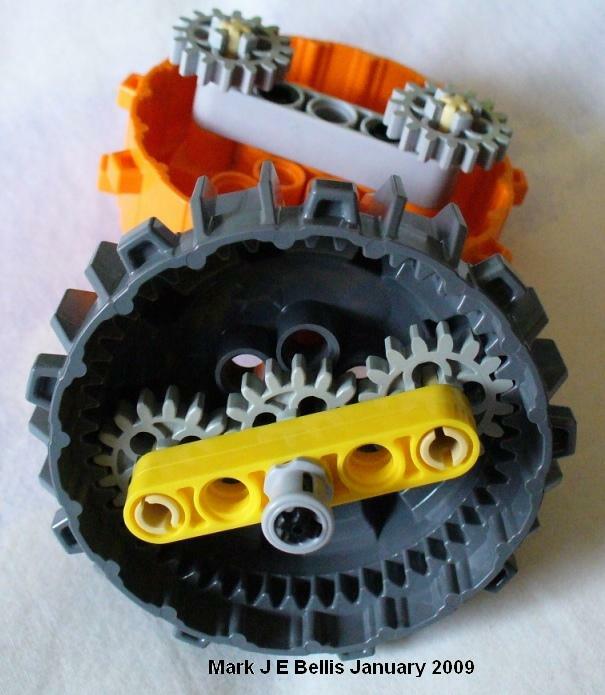 Another use of planerary gear, reduction inside PF motors. 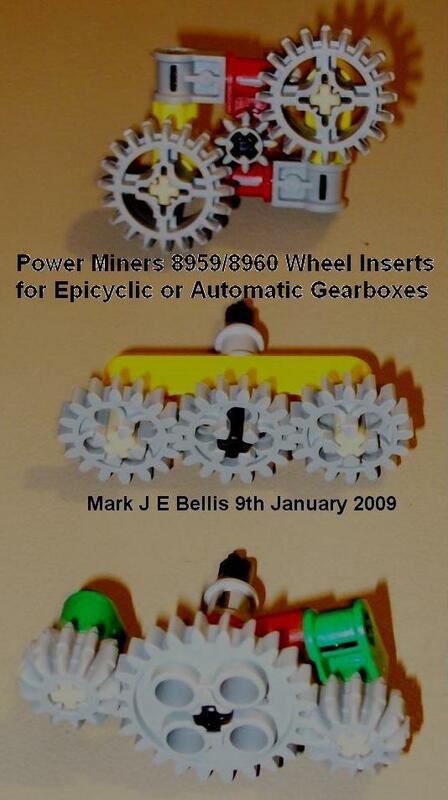 See also Mark Bellis work with Power Miner annular gear! yes, I also immediately remembered that XL-Motor internal photos from Brian. I've also presented them here, some time ago. Regarding Mark's work, I've seen it some days ago, too. I think we both red his explanation somewhere else, but to be honest, I didn't got his point about the stronger mechanism at the time. Now I believe I got it and will update the post, with some of his photos about different gear arrangements. It is! If you read the post to the end. The same Wikipedia article is linked, so there is no plagiarism pretension, but information.